Your house is on fire and you only have a couple minutes to gather your most important possessions... what would you take? Almost everyone includes a few special photos in that treasured list. 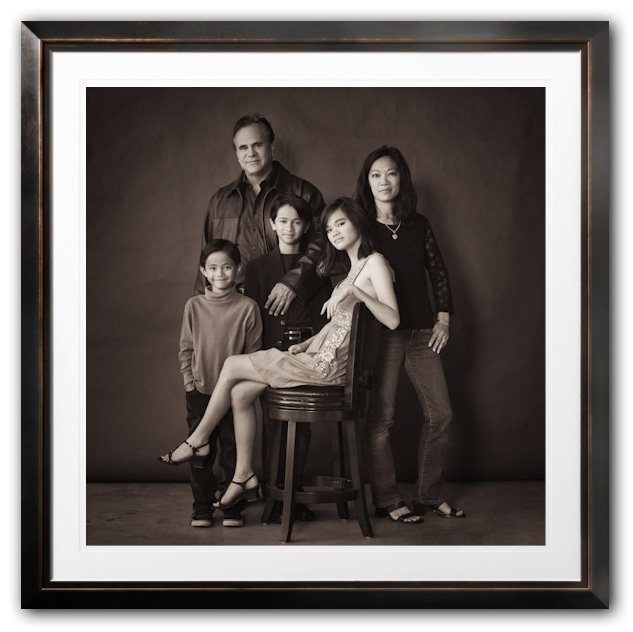 Great portraits become family heirlooms. Each one represents a once-in-a-lifetime glimpse into the happiness that has defined our lives. This is the right way to do a family portrait. We start by meeting in your home simply to get to know each other. I'll do the driving and you provide the glass of wine. We talk about the portrait you dream of creating and I get to see examples of your decorating choices. We look at the area where your print will be hung and visualize what would fit in best. When the time comes for your photo session we work without time limits to create something you will cherish forever. Once your proofs are available we will meet again the in the studio to view your favorites enlarged. We will discuss printing options such as fine art canvas and thick textured watercolor type paper. We will also consider a variety of retouching options from subtle to artistic. The Private Client package is priced at $599 , but this includes giving you a substantial $500 print credit that we will apply to your framed masterpiece. Simple family portrait pricing begins at $199 for a studio session or $219 for a single outdoor location. This is our Basic Package and it assumes one hour of photography will be enough to capture the beautiful images we both expect. As part of this package you receive a $100 print credit so that we can customize your set of prints and other products to be exactly what you would like. Our Silver Package adds a second hour to allow us to photograph in two locations and do more with background and wardrobe changes. The added time also makes it easy to include combinations of individual families, couples and kids. This package costs $309, but now you get a $150 credit to create your ideal set of prints.